The four of us have had an absolute blast with this! Listening to Ashley & Tristen belt out Spirit in the Sky is so fun! I am thrilled to have something to do that holds the interest of all of us. I think this is going to be great entertainment for family and friends! we just got a wii,well it was a present from grandma and I really love how even my 4 year old can play along and have loads of fun. haven't tried the rock band thing yet, pondering, pondering. sounds like yall are having a blast over there. neat if you can sing. me i carry the bucket the tune is suppose to go in. We love playing with the Wii too! Ky can kick all of our butts at bowling...as well as American Idol! Our family loves the Wii too. It is great to have something we all enjoy to do together. I'm saving up for a Wii to give my boys for Christmas next year...I've heard so many good things about it. I love trying to play Spirit In The Sky! It's really just about the only song I can do half way decently! 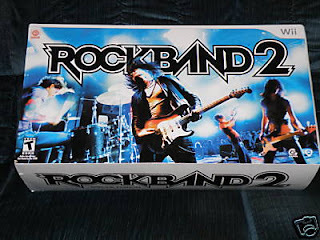 Rock Band 2 and Wii are great!